I’ve been seeing a common question recently – how do I become a better skier? – and I’m immodest enough to think that I have something useful to say on that topic. This is a summary of how I approach skier improvement for adults when I’m teaching. Able to ski more efficiently – with less effort and/or for a longer period. Skiing is inherently a physical skill, and I can’t physically make your body parts move the way that I want to see them move. The best that I can do is try to provide you with opportunities through which you can discover better ways of moving. To improve the chances of that happening, you need to be able to pay attention to what is going on, process what is going on rationally, and be able to explore modifications to your current technique. For that to work well, you need to be calm and focused, which I just label as “happy”. For us to reach that state, we need to feel safe, and it helps a lot of we are also having fun. If you feel scared or distracted, it is very hard to make progress. Spending a lot of time skiing slopes that are too hard for you is a great way to be in a mental state where it’s hard to improve, and it’s also a great way to develop bad habits. However, having said all that, you don’t learn to ski bumps on the bunny hill. Part of learning to ski off piste is getting used to skiing off piste so that you can be in that situation and stay in your happy place, or at least not in your very sad place. A little challenge is good as long as you track your mental state and are functioning well in it. Compare two scenarios. In the first, you are doing a turn every 5 seconds. In the second, you are doing a turn every second. Which one is easier to analyze and pay attention to? The first one is obviously much much easier to analyze. Part of this is terrain choice – choosing a terrain where, at our current ability, we can make turns that are what I would label as “casual”. They’re easy, I don’t have to work very hard, and most importantly, I’m not scared that I’m going to fall. The second part is about technique; finding ways to modify your technique so that a given terrain becomes more casual for you. Note that “casual” is about how you feel in a specific situation. Some people are casual on easy intermediates. Some are casual on black diamond bump runs. There are two topics that come up all the time, often enough that I consider them to be foundational. And by foundational, I mean that not addressing issues will limit your ability to improve. Those two things are stance, and turn shape. Does that work? Well, it can work, but it often doesn’t work great. We want to be able to load (put pressure on) the skis so they will bend and we can therefore use the sidecut to do the turning for us. We want to have our weight centered over the skis so that we are going down the slope at the same rate the skis are, so they are not trying to speed up and get away from us. That boils down to “have enough weight/pressure on the front of the ski so that I can get it to bend and keep up with it”. And the way we exert pressure on the front of the ski is only though the shin pressing on the front of the boot. Which means there is one bit of anatomy that matters more than the rest: the ankle. If the ankle is flexed and there is pressure on the front of the boot, there is pressure on the front of the ski. If it is not flexed, it doesn’t matter how you are leaning or where your hands are, there isn’t pressure on the front of the boot, there won’t be pressure on the ski. Note how the ankle is loose, but also note that the skier is a) leaning forward and b) has hands in front. Those “lean forward, hands up” cue is not working for this skier. The ankle joint is tighter – the shin leans forward – but note that the skier is leaning forward less and has hands that are closer to the body. Looking at the joints in the two images, where are there big changes? The knees have moved forward quite a bit, but the biggest change is in the hips; they have moved forward immensely in the second image. Which leads to my first cue to correct stance; stand up taller and move your hips forward. And also try to keep the angle of your back the same as the angle of your shins. Not only is this a more functional stance, it’s also a more comfortable stance as it relies more on your skeleton to hold your weight and less on your muscles. Great stuff all around. That is the stance that I’m searching for. However, there is something problematic here. Let’s say you are skiing something that is challenging for you to ski and you find yourself in the first position. To get to the preferred, you need to stand up, get your hips forward, and do this while your skis are trying to run away from you. That is generally hard to do because it’s a lot of mass to move, so “stand up and move your hips forward” doesn’t work so great in a dynamic situation. If we can pull our feet back 5 inches, we can regain the pressure on the front of our skis and get them working properly again, and we can make that move much faster than trying to move our whole body forward. It’s not a perfect stance; it’s still too hunched and is going to burn out your legs faster, but it goes us back to a place where they skis are actually working. I think that move is foundational in off piste and bumps. Remember the part earlier where I said that my job is to put you in situations where you can discover a better way of moving? The following is what I recommend to so you can discover what the right stance feels like and ingrain it into your neuromuscular connections. It has four steps. In a sideslip, we start with our skis across the hill and roughly equal pressure on both of the skis, and then roll our ankles and knees down the hill until our edges release and we start to slide downhill. Try it facing both directions, and roll your ankles and knees back into the hill to stop. Here’s a video of what it looks like. You don’t have to be perfect at sideslip for the purposes of this, but if you have trouble with steps 2 or 3 come back and practice this more. Start in a sideslip where you are moving straight down the mountain, and slowly shift your weight forward and back on your skis. When you have the weight forward, your sideslip will move sideways down the hill and go forward at the same time. When you have your weight backwards, your skis will go sideways and backwards at the the same time. Here’s a video of what it looks like. Start by doing it more slowly than the video shows. Pay attention to what your legs and ankles feel like as you are going forward. This is the forward part of the falling leaf held for much longer. Start by going across the hill, and then roll your ankles and knees down the hill slightly to sideslip at the same time. You will need to be in the “forward falling leaf” position for this to work, with ankles flexed and pressure on the front of your boot, and it will feel weird when you first do this. Play around with your stance. Try to stand tall. The feeling you get in the forward part of the falling leaf and in the diagonal forward sideslip is the foundation position you want in your stance. Take the diagonal forward sideslip, and add a turn at the end of it. Make sure you are in the sideslip as you start the turn, and then as you exit the turn, get back into the diagonal sideslip. You should find your turns to be much easier. Because the turning is quick, they ask more from the condition of the snow; if the snow is scraped off or a icy, they feel much more precarious. The motion is so fast that you can’t actually feel what they skis are doing. Remember my part earlier about turns feeling casual so you can focus on what your skis are doing? Z turns make it hard to do that. In progressive turns, things happen *slowly*, so you can easily tell what is going on. So, if progressive turns are so much better, why do so many people do Z turns? It’s very simple; if you try to do progressive turns with a rearward stance, your skis take off downhill when they are pointed at the fall line, and you fall over. My experience is that you can fix your stance, it’s generally fairly straightforward to move towards more progressive turns, but if you want an exercise, I think shuffle turns work pretty well. They are also good because you can’t do them if your stance is too far back. This last week my wife, daughter, and I took a trip to British Columbia to do some skiing. Silver star is 22 km from the town of Vernon. We stayed in a condo on the hill above the village (not on the ski hill side) above the Silver Queen lift. It was ski-in ski-out if you are willing to do a small bit of climbing on your skis. The village is pretty tiny, though there are 3-4 places to eat. All are pretty much exclusively run by young adults from New Zealand, Australia, or other ex-British colonies. This is a pattern all over BC. It was late season, so the snow wasn’t great on Monday. The snow off of the comet chair was okay, the snow off the lower Silver Woods Chair was not. We took one trip over to the backside, which involve some long green runs. The snow there was uniformly awful; it had the wet and refrozen surface that we all hate, and the grooming ridges had set up very hard. We went back on the front side for the rest of the day. It was decent for spring skiing, and I spent a bit of time skiing Attridge face and Christmas bowl. Friday was a different story; there was 6″ of new snow. We headed back to the very empty Alpine Meadows chair, and did laps. I mostly skied off of Ridgeback, and found anywhere from 4″ – 6″ of untracked, with a few deeper spots I the trees. It was obviously very nice. When that got skied out a bit, I headed more to the left and found some glorious turns on untouched snow on the Fastback run. And then I found out why; those runs only feed below the village on the entrance side, so it’s a cat track out, a trip up the Silver Queen lift (back by our condo), and then cat tracks to get back to the Comet six-pack, and then some skating to get back to the Alpine Meadows chair. That took a bit of time. After lunch we headed to backside to ski Eldorado. This is marked as a blue, but it is really a very long cat track with a couple of blue pitches on it. It’s there so that more advanced terrain can be accessed. This is the same story for Aunt Gladys on the other side. On paper, there is a ton of terrain on the backside, but they really need two or three lifts to make it accessible without a lot of traversing. Solo after the others headed back to the front, I skied Cantastic glades at the top, which still had some very nice snow on them, and then ducked into Doognog, a double-black with a thin entrance. And it lived up to the billing; it was tight, bumpy, and steep. Most of the new snow was scraped, so I sideslipped the tight sections and very carefully skied the rest. With one more run in my legs, I decided to head down 25 north and sunny ridge. These are real blues and had some nice snow on them. Then I made the mistake of turning off into Sunny Glades, and they lived up to their billing, with about 9″ of the gloppiest snow you have ever seen. Access back to the front side is via a very long run and sometimes flat run “last chance” or a tee bar. I took the t-bar. I think it’s a pretty decent mountain to ski at, and would be a great family mountain. The backside has potential, but all of the traversing and cat-tracking got on my nerves. Village is a little small but was okay (though don’t think you can buy groceries at the grocery store). The condo we got was nice and fairly cheap, and Vernon is close enough if you need civilization. 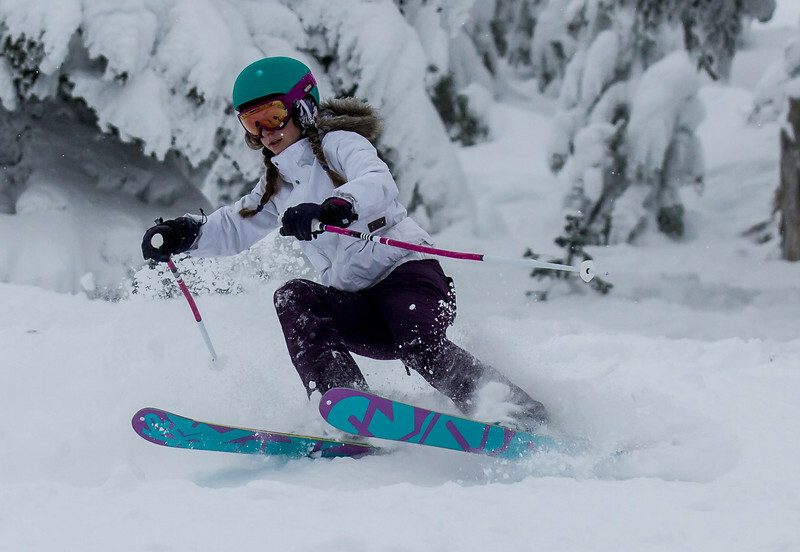 Silver Star is a member of the Powder Alliance, which means you get to ski free if you have a Stevens Pass Season’s Pass. This is a really nice benefit that saved us quite a bit of money. Oh, and if you get the chance, do the sleigh ride to dinner. The sleigh ride was fun and relaxing, and the food was pretty good. If you like Nordic skiing, there were a *ton* of trails around and a lot of extremely fit skiers. They claim to have the largest network of groomed trails in North America; they have 55 km of trails and you can dual-pass to get another 50 if you would like. There was also some fat biking. Big White is the big daddy in the neighborhood. 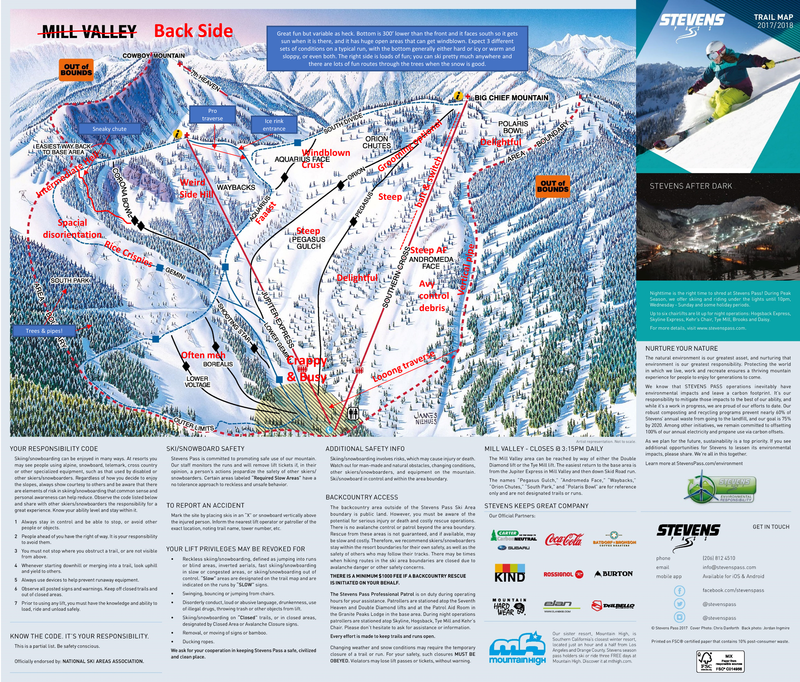 It is big, with 15 different lifts, and a whole lot of different terrain. If you want the resort experience, this is a good place to go. There is a fair bit of terrain variety, but on the day we were there, we ran into fog at the top of Powder chair. This is a common enough experience that the resort is nicknamed “big whiteout”. Having never been there when the top was clear, I can’t tell you what it is like, but there isn’t a ton of high-level skiing here. It’s a great intermediate mountain, however, and there is a ton of on-slope housing. Even with the amount of available slopes, it actually felt crowded, though we never had much of a wait for a lift. We skied the Snow ghost & ridge rocket blues, spent some time playing in the glades off of the black forest express. I also recommend a trip through the skiercross/boardercross course in the Telus park; it is a lot of fun. Big White runs from about 5000′ to about 7600′ at the summit, if you could see anything when you got up there. There’s a small parking lot, a small base building and an attached hotel, all plunked down in the outskirts of a small town. The base area is only at 1,680′, and given that it was late March, there wasn’t really much of what you would call snow left there. There is a small magic carpet, and a single gondola. 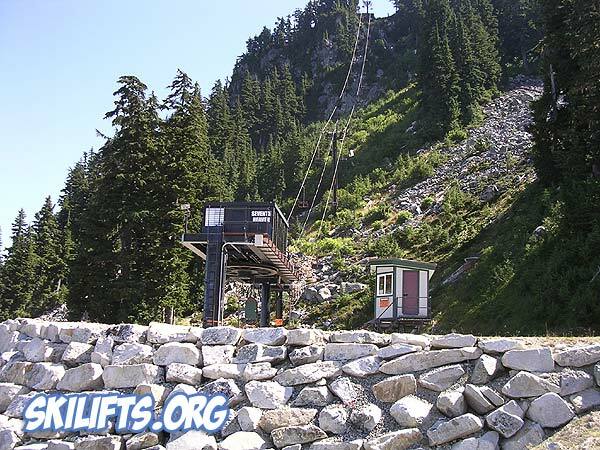 This Gondola takes you on a 4-minute ride up the hill, up to Revelation lodge at about 2300′. There is a small magic carpet there (both for skiing and getting back to the gondola). It was technically possible to ski down from there to the base, but we did not attempt it. If you hop on the upper Revelation Gondola, it will take you on a 9 minute ride up to Mackenzie outpost at about 5000′. There are a number of blues and blacks below the Gondola but the snow didn’t look great on the way up, so we opted to skip it, and we skied down to “The Stoke”, which took us another 2000′ up the hill to 7,300′. And then we skied. The lower slopes looked sparse because of a fair bit of rain the night before, but that gave us 8-10″ of fresh on the top. We came down Critical Path, which has the distinction of being the steepest blue that I have ever skied. The snow was soft, and once I got a bit warmed up, we had a nice time. We also skied snow rodeo a couple of times before lunch. 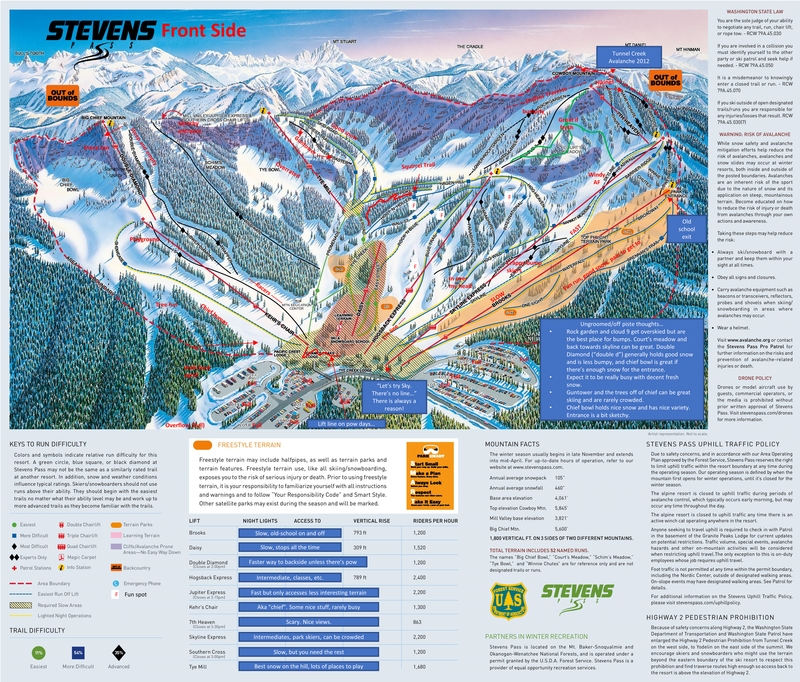 These are *long* runs; Stevens Southern Cross is about 1700′, so the Stoke is about 20% longer than that, and if it was mid-season with good snow, you could ski the rest of the way down to revelation lodge, something like 4500′ of vertical. Which, honestly, is a bit nuts. It didn’t take long to tire ourselves out, and we gondola’d back down to Revelation Lodge for lunch. Here you have a lot of choices; you can go the cafeteria, or you can go to the cafeteria. Revy is not currently a place with a lot of dining options. After getting our food from the British/Aus/Kiwi staff, we headed back up the gondola and back up “The Stoke”. We were headed to the North Bowl. There are two ways to get there; if you like really steep double blacks, you hike up the Lemming Route or traverse over to the edge. I am not good enough to do that, so we skied the top bit of The Stoke and took the Ripper Connector, a blue. And we skied, then we skied some more, and then we skied still some more. I can’t find any elevations, but my guess is that we dropped a bit over 3000′. Powder bowl only has three runs – all blue – with a lot of “glades”. I put quotes there because they aren’t really gladed enough for me to really be able to ski them. We skied a bit of the edge and then under the chair a few times, until or legs got tired of trying to turn into the now heavier-than-normal snow. The Ripper chair is only 1600′ in elevation, and at the top you can see the runs on North Bowl, which look ungodly steep to me, and at least 1500′ long. Come ski here only if you like steeps. The blues are fairly steep, and the greens are only cat tracks. And – if you want a little more experience – they offer cat skiing packages that take you outside the ski area. And – if you still want more – Selkirk Tangiers Heli Skiing leaves from the base area. The whole experience is a little hard to wrap your mind around. They have big plans to add more lifts, on slope housing, the usual resort things.